I was delighted to meet with Chinese for Labour in Liverpool on Sunday 23 September 2018. I support the thriving Chinese community in Walsall South. 30.7% of Walsall South is of Asian ethnicity. 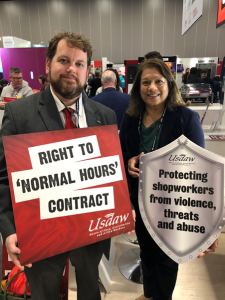 I met with the Union of Shop, Distributive and Allied Workers (USDAW) to discuss the retail sector which is one of the largest employers in the UK and contributed £94.6 billion to the UK economy in 2016. It is vital that we protect shop workers and ensure the continuance of our high streets. 21,000 jobs were lost in the retail sector in the first three months of 2018 due to store closures and company administrations. Walsall has lost Marks and Spencer’s and Poundworld. HM Opposition Labour Party held an Opposition day on the ‘Retail Sector’ on 6 June 2018 to call on the Government to urgently publish a strategy for the retail sector. The Government’s industrial strategy contains only three references to the retail sector. The Government has presided over the biggest squeeze in wage growth in a generation, is failing to provide certainty around future trading arrangements after Brexit and has failed to ensure a fair business rates system. 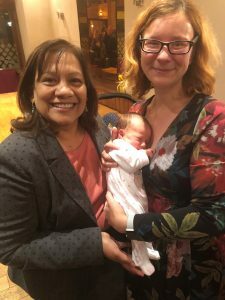 I was delighted to also meet one of my newest constituents, who is only 4 weeks ago (pictured below).